Brownies are by far one of my favorite desserts! I am a chocoholic through and through. S’mores also happen to be one of my summer favorites! I decided to combine the two into one fabulous dessert! I mean really though. What is not to love about graham cracker crust, fudgy brownies, melted chocolate and toasted marshmallow?! I could not stop eating these. My self control went out the window. If you are looking for a delicious dessert and want to put a fun spin on a classic favorite. try out this recipe! You will not be disappointed! These brownies are simply AMAZING! 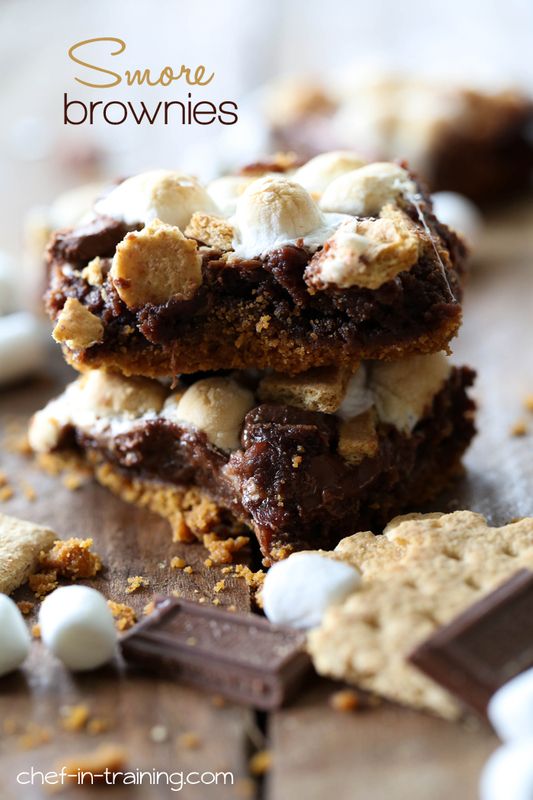 S'more and Brownie combine to create a delicious dessert! Combine graham cracker crumbs, sugar and melted butter in a medium bowl and combine well. Press into a 9x13 pan and bake at 375 degrees F for 7 minutes. Remove from oven and reduce oven heat to 350 degrees F.
Cream butter and sugar together. Add eggs and vanilla and mix until well combined. Add cocoa, flour and salt and stir until well mixed. Pour over graham cracker crust and bake at 350 degrees F for 15 minutes. Remove from oven and evenly sprinkle topping ingredients over the top and bake another 10 to 15 minutes. Of all the S'more deserts out there, I think this will be the largest hit with my family. Perfect anytime, and tasty! I absolutely must make these this summer! Made these, they are now my new favorite brownies! Yum!!! Hey! So I made these & I have a few questions! Are the brownies supposed to be done before you put the topping on? My brownies were almost completely not done after 15 minutes had gone by. Realizing I had to cook them for another 10-15 min, I put the topping on anyways. Once 15 minutes was up, my brownies were still not done in the center (the topping would slide back and forth if I tilted the pan at all), but I don't want to put it back in the oven and risk burning the top! Any helpful hints?